Novelty yarns make this scarf warm and pretty! 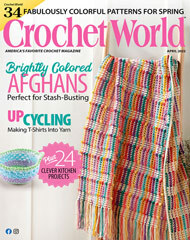 Stitch it quick with a size K double-ended crochet hook. Size: 6" x 42", excluding tassels.